i.e. 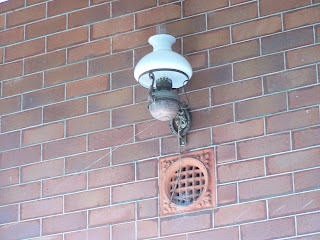 a ridge of white mortar ran along the joints between the bricks. 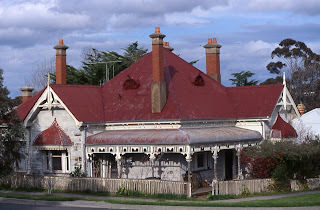 * Dominant roofs often broken by false gables and capped by terra cotta frilled ridges. *Turned timber verandah columns supplemented by elaborate timber decoration. * Extensive use of verandahs and sun screen devices. * Leadlight or coloured glass windows. * Mosaic tile or marble porch and hall floors. * Often finials and cresting to the roof. * Classical mouldings around windows, doors and brackets under eaves. * Elaborate four panel doors. The thread of innovative architecture which began in the early 1880's was unified by the use of red brick and a striving for picturesque styles. It culminated in the Edwardian interpretation of Queen Anne elements and it flourished in the first decade of the 1900s. As a style, it began after the 1892-1894 depression and lasted until World War One. Its essential qualities are red brick walls, often tuck pointed, a picturesque roof, often of slate or red interlocking Marseilles tiles with multiple gables and spires, and painted timber work that replaced cast iron on verandahs. 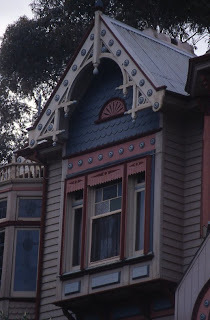 This was a marked contrast to the slate, corrugated iron and stuccoed walls of the Victorian era. Strong colour was for the first time found in the materials used to build the house. AUSTRALIA had finally found its own distinctive style of house. 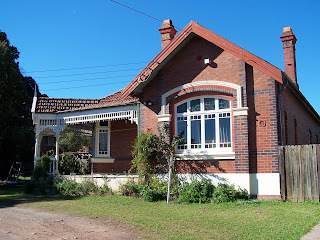 Rough cast render, wooden shingles, decoratively cut weatherboards and terra cotta ridging were used extensively. Timber fretwork and bracketing, which was geometric prior to 1900, became infused with the sinuous curves of Art Nouveau, which also appeared in the leadlights of fanlight and casement windows and front door glazed panels. 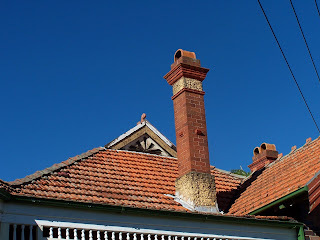 Floors and turned posts off verandahs were entirely of timber, bay windows were used almost without exception, tessellated tiles appeared on verandahs and in bath rooms and wash houses. Gables were either shingled or half timbered with stucco infill, with the timber strapping imitating the Rising Sun symbol. Timber as external decoration was used creatively and copiously - a style that has since been unmatched. Fretted timber was also used inside as replacements for Victorian plaster arches in hallways and bay windows. Entry halls meandered to various rooms in a less formal style, ceilings still featured plaster cornices and decorative roses, and Wunderlich's pressed metal panels were used as dado panels and ceiling decoration. Joinery was painted in creams and browns, grained or stained, and interiors were less crammed with ornamentation and trimmings. Fireplaces were often set into the corners of rooms at 45 degrees, giving a different approach to furniture layout. Fencing was typically either pickets around 1.2m ( 3 feet ) high, or flat boards set two up two down, they housed ornate gates, that when you passed thru you came across very well laid out formal gardens. If you are fortunate enough to own a Federation house then there is a wealth of books available to you, such titles as "Getting the Details Right", "Towards the Dawn" and "The Federation Garden" just to name a few are all available at any large bookstore or there is a very good publication called Conservation of Federation Houses available from the Department of Planning's Heritage Department 175 Liverpool St Sydney to help you restore your treasure.